Enjoy this collection of nursery rhymes that Emma, Lachy, Simon and Anthony have selected, arranged and performed for you. Families all around the world have sung nursery rhymes to each other for many generations! Nearly everybody has a favourite nursery rhyme from when they were children. Simon tells us his favourite was, and still is, “The Old Woman Who Lived in a Shoe”, Emma can’t go past “Three Little Kittens”, Lachy loves “Wheels on the Bus”, whilst Anthony’s favourite is “Old MacDonald Had a Farm”. 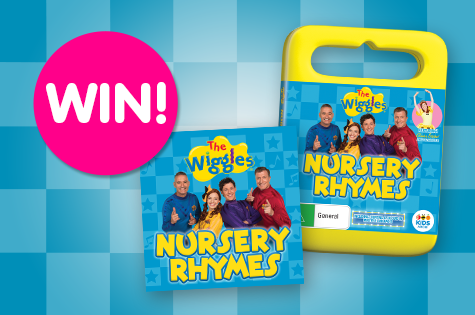 Children learn best through play and we hope THE WIGGLES NURSERY RHYMES will encourage children to sing, dance, play and tell stories inspired by these great renditions. My baby girl is wiggle crazy at the moment. Would really appreciate this for when my internet is playing up which is ALL THE TIME. And boy she’ll let you know when it’s freezing. Help a mumma out. Will be gifting this one to my gorgeous great nephew Dylan who is yet to be introduced to the Wiggles. I know he will love them just as my kids did.